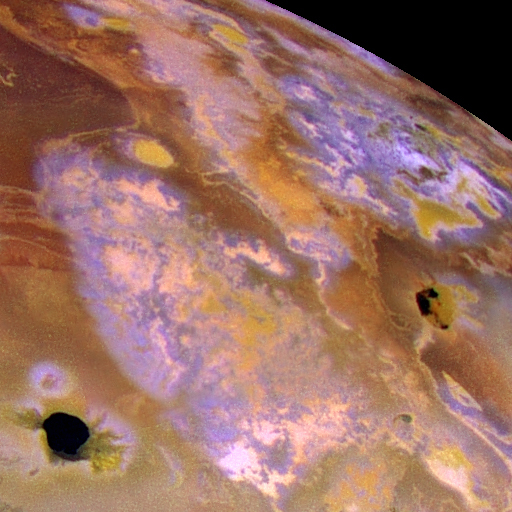 NASA's Galileo spacecraft acquired its highest resolution images of Jupiter's moon Io on 3 July 1999 during its closest pass to Io since orbit insertion in late 1995. This color mosaic uses the near-infrared, green and violet filters (slightly more than the visible range) of the spacecraft's camera which have been processed to enhance more subtle color variations. 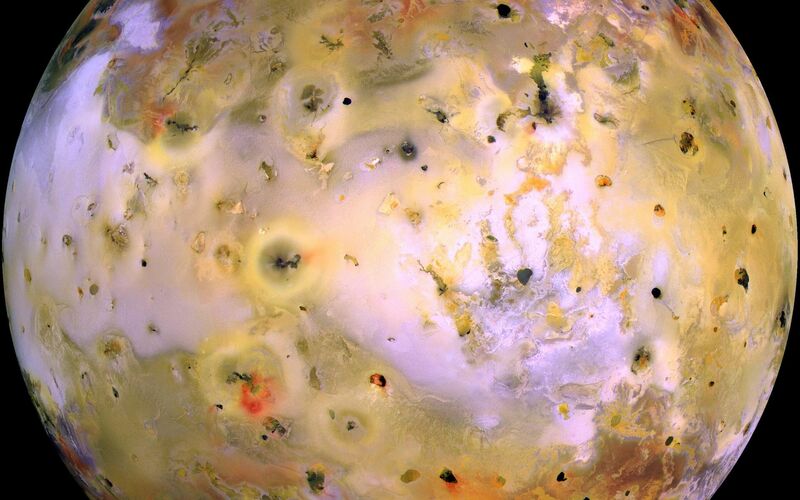 Most of Io's surface has pastel colors, punctuated by black, brown, green, orange, and red units near the active volcanic centers. 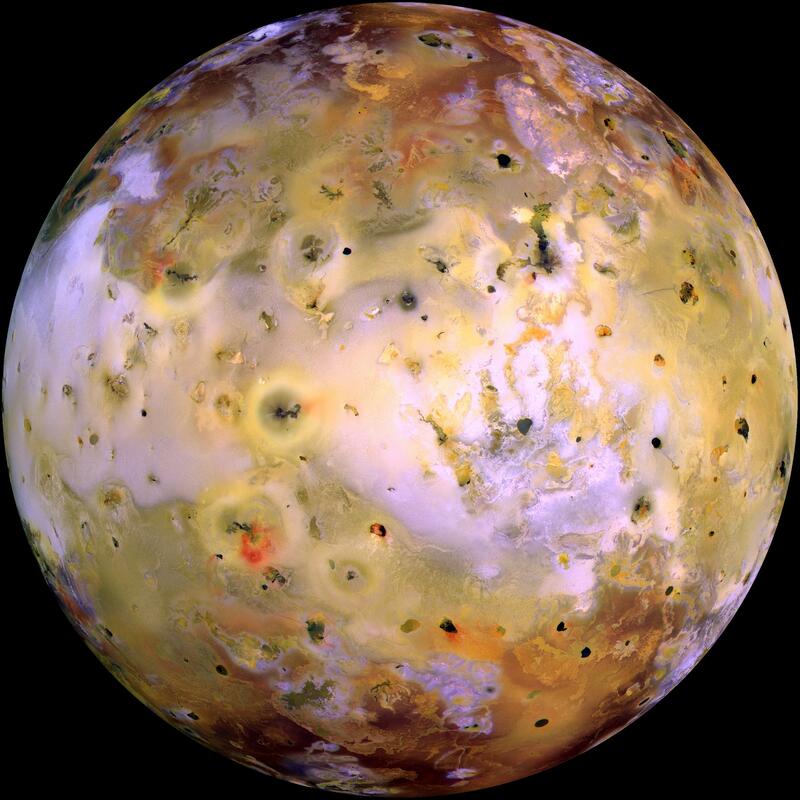 A true color version of the mosaic has been created to show how Io would appear to the human eye. The improved resolution reveals small-scale color units which had not been recognized previously and which suggest that the lavas and sulfurous deposits are composed of complex mixtures (Cutout locations), (Cutout A). 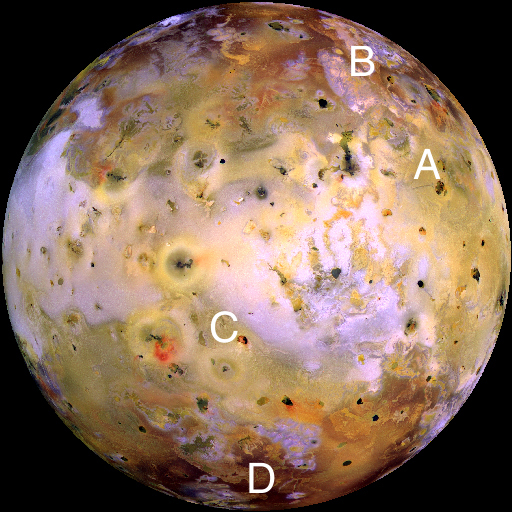 Some of the bright (whitish), high-latitude (near the top and bottom) deposits have an ethereal quality like a transparent covering of frost (Cutout B). 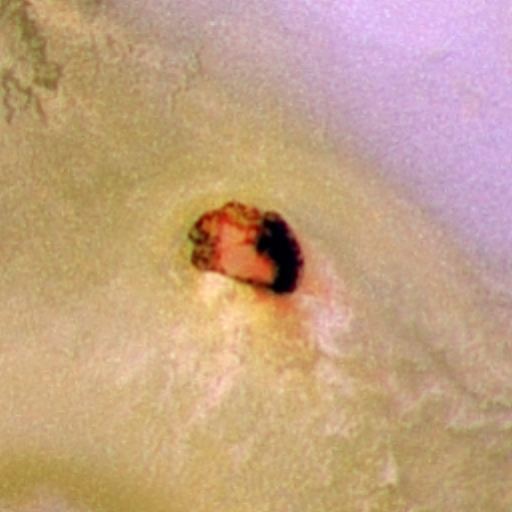 Bright red areas were seen previously only as diffuse deposits. However, they are now seen to exist as both diffuse deposits and sharp linear features like fissures (Cutout C). 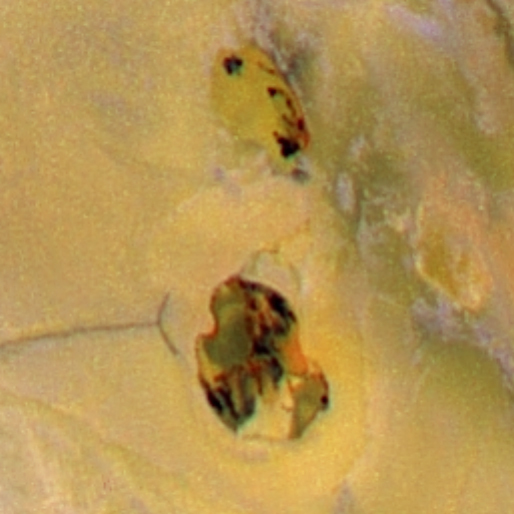 Some volcanic centers have bright and colorful flows, perhaps due to flows of sulfur rather than silicate lava (Cutout D). In this region bright, white material can also be seen to emanate from linear rifts and cliffs. 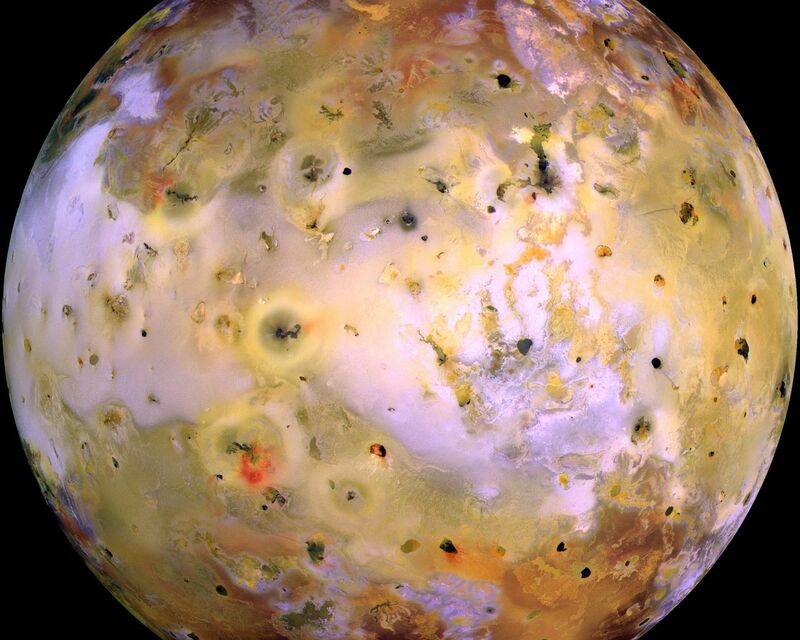 <!--Comparison of this mosaic to http://www.jpl.nasa.gov/galileo/sepo./atjup/io/color.html">previous Galileo images reveals many changes due to the ongoing volcanic activity. 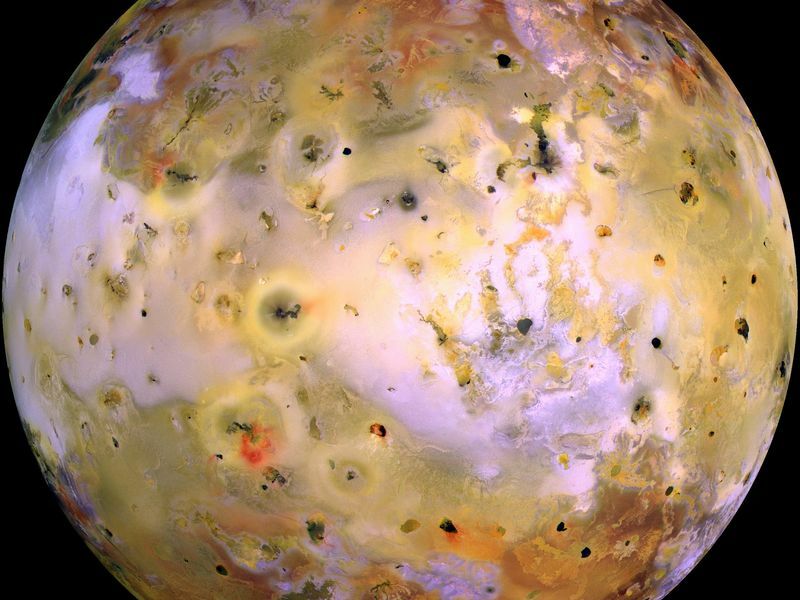 -->Galileo will make two close passes of Io beginning in October of this year. Most of the high-resolution targets for these flybys are seen on the hemisphere shown here.